The Flyers don’t have excess spending cash or glaring areas of weakness on their roster. But according to Chris Botta of FanHouse, that won’t stop general manager Paul Holmgren from making a move at, or before, the deadline. Although opening day of training camp is still roughly a month away, that doesn’t stop the Flyers’ front office from building the framework of the forward lines. 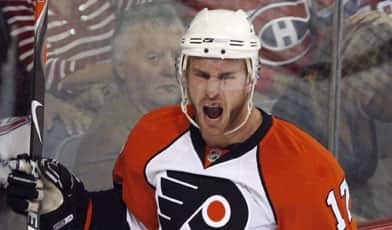 According to CSNPhilly.com, the Flyers are planning to start training camp with Mike Richards centering Claude Giroux and Dan Carcillo. This might come as a minor surprise considering that Giroux proved late last season that he flourishes at the center position. However, Giroux will be replaced as a pivot by Jeff Carter, who will be between Ukrainian sniper Nikolai Zherdev and sophomore James vanRiemsdyk.